I know this firsthand. In the summer of 1986 after my sophmore year of college, I convinced my folks to let me drive from Ohio to Atlanta, Georgia to live with my high school girlfriend (do I have your attention now? WHAT were my parents thinking?) for the summer. I worked variously as: the drive-thru guy on the closing shift at McDs; the opening shift biscuit maker at Bojangles; and a door-to-door salesman of framed “art” prints suitable for every home décor and various motels. Seriously, it was considered a coup to actually convince a motel manager to buy all new “art” for their rooms. I was not very good at this, but you had to buy the prints you took as samples (or sell them) so I was stuck. So I faked a death in the family and convinced them to let me return my stock without paying. There were tears. It worked. And that’s when I knew I was a good actor/liar. That summer, I simultaneously fell in love with making biscuits and vowed never to enter a McDonalds ever again, two critical milestones that shaped my culinary path for decades. But back to the movies. A group of us went to see a movie and snuck in some snacks (clearly this was my summer of breaking the rules). About fifteen minutes into the flick, a rotund balding man with a bulging red face came up behind us and asked us to leave. And that’s when I knew I couldn’t act/lie my way out of everything, and sometimes there are consequences. I still live in fear of that tap on the shoulder as I surreptitiously pull out my baggie of contraband. Just FYI – I do a Truffle & Caramel Popcorn mix that will blow your mind! Once all this rosemary-garlic-hoopla dies down, I’ll bring it on! Promise. 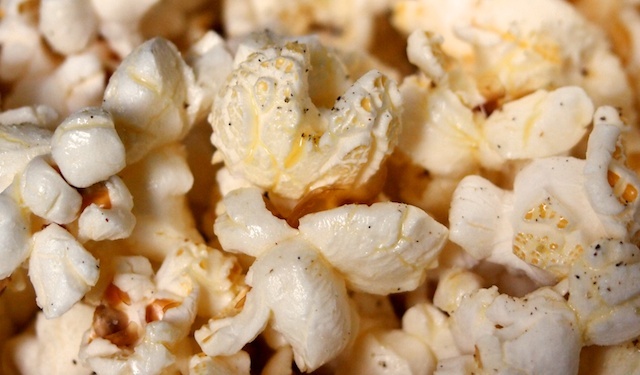 Pop your popcorn however you like (except for microwaving – yuck and yuck). Use your electric popper, an air popper or use the instructions below to go Old School and pop it on your stovetop! Popping Old School: In a large pan with a tight fitting lid, combine the oil and popcorn. Cook over medium heat until the first few kernels pop. 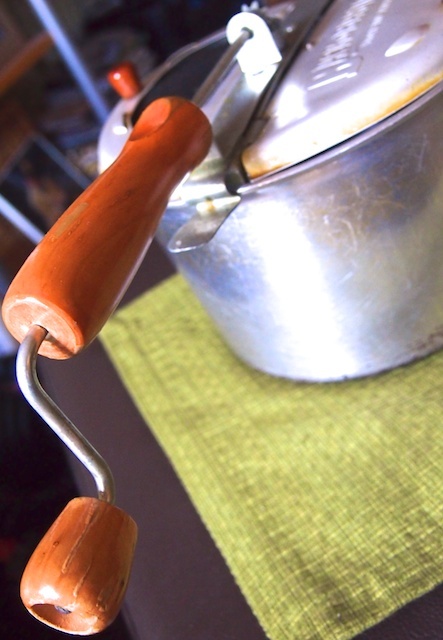 With one hand holding the lid (protected with an oven mitt, of course) and the other on the handle, swirl the pot constantly keeping constant contact with the burner surface or grate – the point is to keep the kernels moving. Less than two minutes later, YOU’RE DONE (when the popping slows to one ‘pop’ every second or so. Season to Taste: the toss and taste method Remove from heat immediately and pour into a large mixing bowl. Use a plastic squeeze bottle to drizzle Rosemary Garlic Olive Oil on the top. Toss lightly to combine, season with salt and a turn or two of black pepper. Toss and taste. Repeat to add more oil, salt or pepper to taste. Notes: Make another batch while you’re in the kitchen. Trust me, making it now will save you from having to stop the movie after 15 minutes to go make a second batch which I promise you’ll have to do once you see how fast the first batch disappears! Sorry. But don’t say I didn’t warn you. Note: Orville and I LOVE popcorn, and we swear by our Back To Basics popcorn pan. We’ve had it for nearly 10 years, and it’s actually faster than microwave popcorn (again, yuck): 2:30 from kernels in a cold pan to hot popcorn in a bowl! OLD old school!